Summertime...and the living is easy. Well, maybe not; but at least there’s plenty of good fresh food to choose from!Included in this seasonal ‘harvest from the sea’ is the largest of British prawns. Measuring about 10cm long, Dublin Bay prawns are at their best during the summer months. Although frozen prawns - of varying sizes and tastes - are available throughout the year, for sheer meaty sweetness try some fresh Dublin Bay prawns in the summer - you will be amazed! A word of warning though: don’t go rushing off with your nets; because this prawn is actually fished off the North West coast of Scotland. To further confuse the prawn-seeking cook, Dublin Bay prawns are also called langoustines because they are small lobsters. As the tail is the meatiest part, they are also referred to as scampi, by some. Whatever you want to call them and wherever they’re from, let’s get on with the important business of eating them! The following quantities will serve four people as a main course. Preheat oven to 180ºC or barbeque the prawn tails. 1. First of all, use the point of a sharp knife to slit the underside of each prawn tail. Do this on both sides (left and right) to ensure even cooking. 2. Using skewers thread the prawn tails securely and alternate with bay leaves. Use four prawn tails on each skewer. 3. Add a generous shake of sea salt and black pepper. 4. Use enough olive oil to grease a baking tray, then, place the skewered prawn tails on the tray and drizzled the remaining oil over them. 5. Cook for 12-15 minutes, turning once. 6. Melt just under half of the butter in a frying pan and gently cook the garlic. 7. Remove the garlic from your pan and dispose of it. 8. Then, add the brandy (or whisky or vermouth) and Worcestershire sauce to the pan. Increase the heat to reduce this liquid by half. 9. Beat the remaining butter and anchovy essence together and add this to the frying pan of brandy/Worcestershire sauce. Next, add the lime juice and mustard and stir well. Serve with plain boiled rice, or crusty bread, and a crisp green salad. Make a dressing of 90mls olive oil, 30ml dry sherry, 2 cloves of garlic (crushed) and 1 teaspoon French mustard. Heat in a small pan and keep the dressing warm while you cook the prawns and bacon. Cook the prawns with rindless, diced, streaky bacon (about 115g) in a little olive oil. Prepare a salad of fresh young spinach leaves and lettuce of your choice. 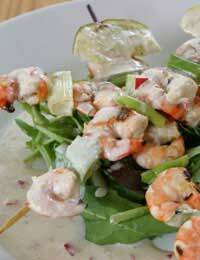 As soon as the prawns and bacon are cooked, spoon them onto the salad and drizzle the hot dressing over them. Serve immediately with crusty bread.